Ely and Elsa came into our family around the 8th of July and it has not been the same. I think it was love at first sight and we knew that they were meant to be part of our family. They are such a joy and have such awesome personalities. Even though they are from the same litter and look alot alike, the likenesses end there. 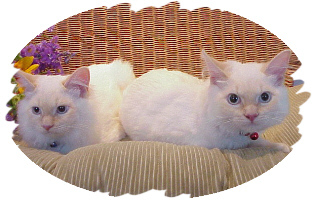 Ely is laid back and easy going and Elsa prim and proper and definitely the more aggressive of the two. They both love to be cuddled and their tummies and paws rubbed, but being cats they want it when they choose, not necessarily when you want to give them lovings. Ely and Elsa love boxes and anything else they can climb into and we have discovered that Ely loves water. Elsa is checking it out now too. They wait until you get out of the shower and then they have to go in and sit in the water. We have some really special stories to share with our friends and know that there will be lots more to come. I hope that those who adopt a pet will turn out as awesome as ours has. Ely and Elsa are loved and spoiled like all pets should be. 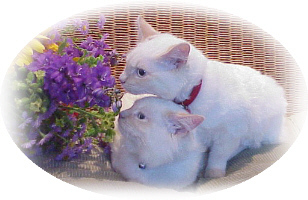 A very special THANK YOU to Alison for sharing Elsa and Ely's story. We had the opportunity to meet these two very special kitties. What a joy to see how well they're taken care of. 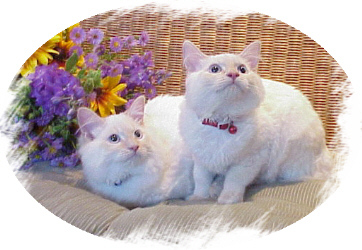 Their coats are rich and full and radiate good health. If you've adopted from Feline Friends, we'd love to hear from you and publish your story online.